Fabulous grad card Bunny, great colours. What an adorable image and sentiment. Great graduation card for our masculine theme. Love it! Thanks for joining us on the Simon Says Stamp Monday Challenge. Super layout and details for this cutie, a great look for a male graduate. Thanks for joining our challenge at Catch the Bug, good luck in the draw! This is such a fun card, I love the sentiment! 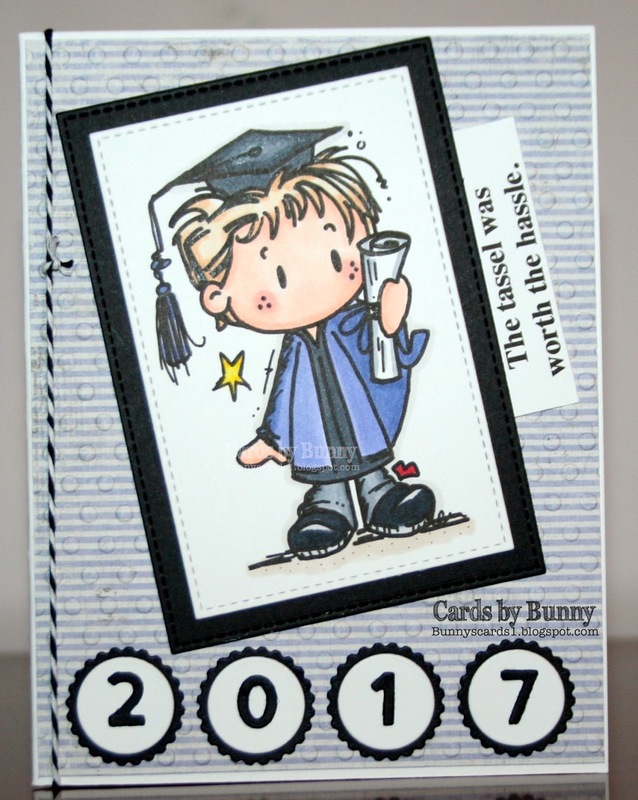 Fabulous graduation card for a young man, Bunny! Terrific coloring and I love the sentiment. :-D Thanks so much for entering our "Anything Goes or For the Guys" challenge at QKR Stampede this week. Thanks for supporting us and good luck in the draw. Oh, my! This is so sweet! Thanks for sharing and for playing along in the Friday Funday Challenge! this card is very sweet, great for graduation. Love the sentiment! Thank you for joining our challenge at QKR Stampede. OMGosh such a smart card. I love the sentiment. Thanks for joining us in the Friday Challenge at Jo's Scrap Shack! What a cute image for a graduation card, Bunny, and love the sentiment too. This Bugaboo's grad is absolutely adorable Bunny! I really like your coloring! Beautiful! Have a lovely week. Hugs. cute grad card! i love the sentiment! thank you for playing along with us at the simon says stamp Wednesday challenge! Brilliant card! Great image and sentiment! Love it! Thanks for sharing with us at Lil Patch of Crafty Friends. Super cute grad card!! He is so adorable! !Awesome coloring too!